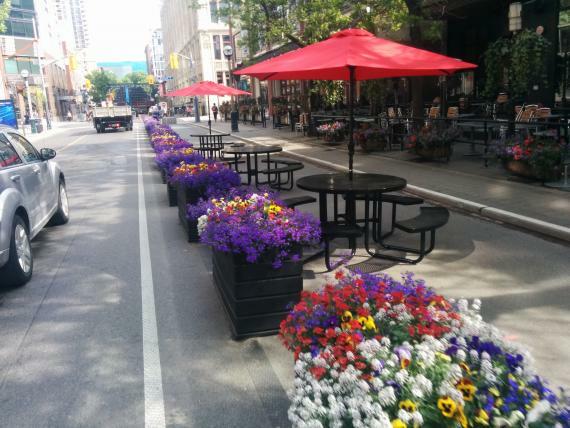 Bikes were purposefully excluded from Bloor Street at Yorkville during the major, BIA-funded remake of the street. In 2008 former Councillor Kyle Rae told City Council that he didn't think bike lanes were appropriate for Bloor Street at Yorkville because that area is a "destination" with lots of retail. That looks a lot like four lanes of "through traffic" to me. Note to planners: it's not "shared space" if cyclists are forced to dismount. A person walking a bike is just a pedestrian. 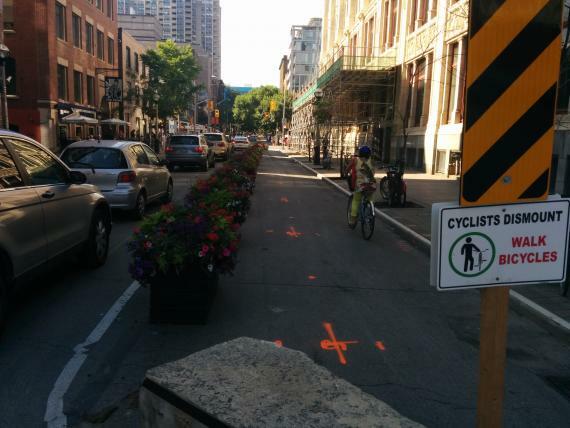 Its part of a pilot project to implement the john st corridor. The pedestrian flow is spilling into the street further down the street. Chock-a-block side walk induce safety issues. We are trying to find a balance and determine the right lanes widths for different modes. It's hard to align this claim that pedestrians are spilling off the sidewalk with a plan that allows the BIA to then block the pedestrian space with tables. Tables that seem to be an extension of the restaurants next to them. Just how do tables help pedestrian flow? 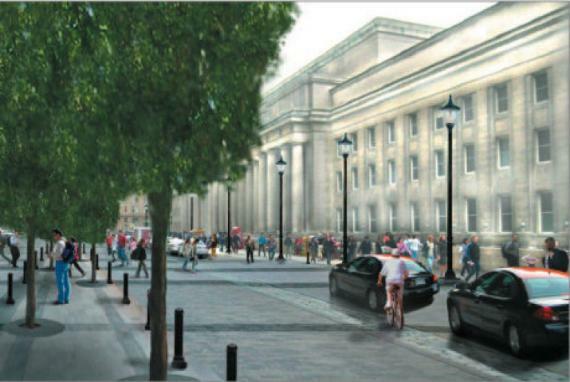 Coordinated with the redevelopment of Union Station, the planners in charge of the Front Street EA marginalized vulnerable cyclists as well by dismissing bike lanes. Planner Harold Madi made it clear to the National Post that bike lanes wouldn't be part of the plan: “this isn’t about through-traffic; it’s about a destination." Yet here too "destination" seems to be more an excuse to ignore bike lanes than to be a way to stop through-traffic. (Madi is now in charge of Toronto's Complete Streets guidelines. More on that below). This is how the planners imagine Front Street will function. The cyclist ends up riding the meridian because taxis are weaving in and out of the taxi bay. I'm surprised how realistic the artist was in how chaotic an environment it will actually be. Vulnerable-feeling cyclists won't bother to take this route. Toronto is weird and likes to do things in its own messed-up way. But the results of shared space have been little better elsewhere. The Shared Space movement aims to bring about harmony between road users by seeking "to minimise demarcations between vehicle traffic and pedestrians, often by removing features such as curbs, road surface markings, traffic signs, and regulations." 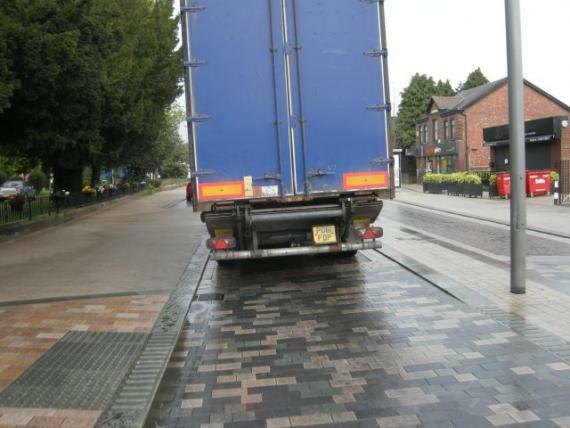 Even other celebrated examples such as in Poynton, UK, designed by the preeminent shared use pioneer Ben Hamilton-Baillie have improved a demarcated pedestrian space but has utterly failed to deal with the heavy traffic volume and forces cyclists to intermingle with large trucks and fumes. 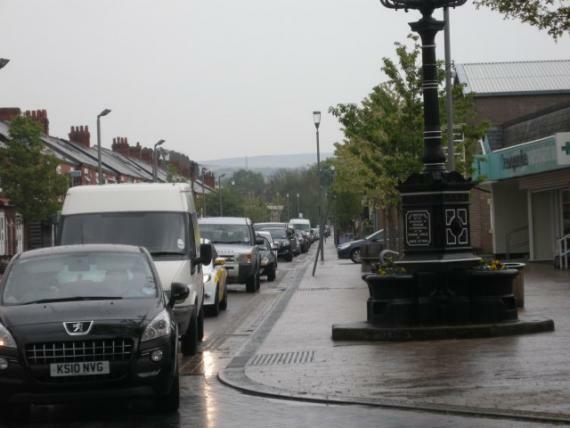 The biggest (unresolved) problem - and one which is perhaps unfair to tie together with the redesign, since no redesign can deal with this problem – is the extraordinary volume of motor traffic passing through the town. With all the extra space given over to sidewalks, cyclists, if they wish to follow the rules, are forced to wait in the fumes of backed-up traffic (Photo: Treasure). That empty sidewalk is very inviting and feels a lot safer than the road (Photo: Treasure). I will more forcefully argue that the planners could have dealt with the heavy traffic by more clearly demarcating space for cyclists and pedestrians and by putting restrictions on motor vehicles. 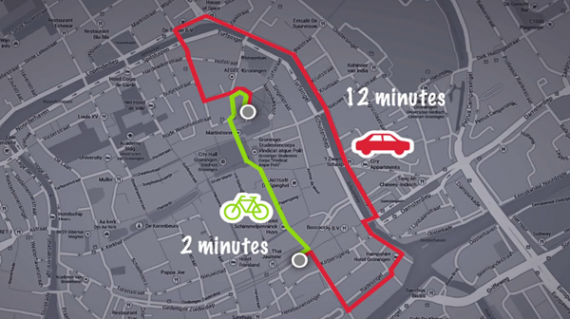 This is the successful approach taken by cities such as Groningen, Netherlands where cyclists can make direct, fast trips between points in town and motor vehicles are forced to take slower, indirect routes. 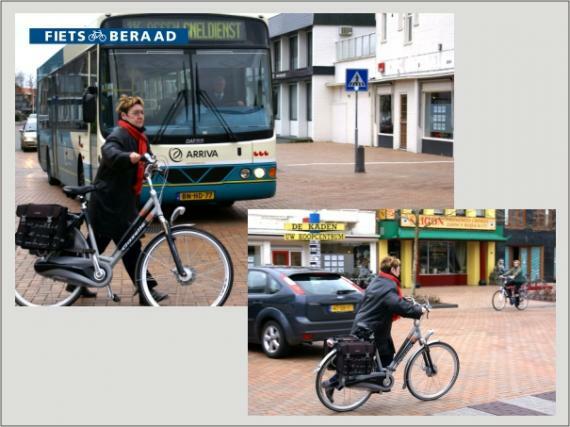 This helped to make Groningen number one in terms of cycling mode share in the world. Yes, shared space is a form of anarchy – peaceful anarchy – showing the great advantages of self-regulation over state control, and no, it instils a sense that might is wrong. The greatest sin of Cassini's and other shared space proponents is—in my mind—that they prefer to plan based on a vague utopian agenda rather than choose tried and true real-world examples from such places as Denmark and Netherlands. A shared street does "not serve the vulnerable. Rather, it prioritises the powerful". Even in the Netherlands there are a handful of shared space experiments. In footage taken by blogger David Hembrow, Hembrow points out how the vulnerable--the elderly, mothers, children--end up intimidated by the heavy car traffic (in 2008 and 2014, ending up just giving up their right of way in return for a greater sense of security. 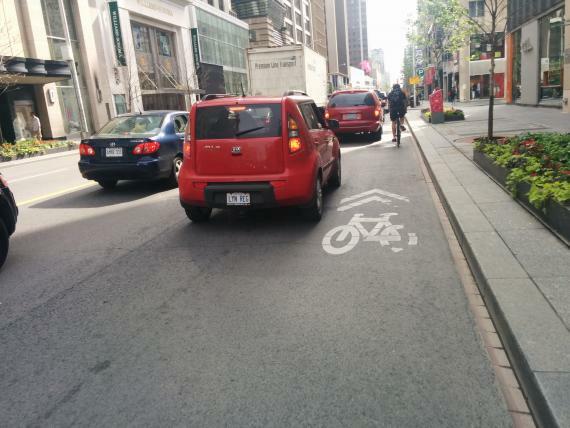 "[p]art of the cyclists does not dare demand the right of way. They dismount and wait for the right of way to be clearly given. Then they walk or ride to the other side. A problem may be that halfway across cyclists are met by cars from the other direction having to be kind enough to yield informally. Due to low speeds and the defensive behaviour of these cyclists this crossing strategy need not be unsafe by itself, but it most certainly is not convenient." A majority of the cyclists, Fietsberaad noted, end up using the pedestrian crosswalk for understandable reasons: "[c]yclists probably prefer this to the chaos in the middle of the square (with cars queueing from three different directions). In addition they are given (or demand) the right of way on the pedestrian crossing, although formally they are not entitled to this." Complete Streets should not ignore these concerns of "Subjective Safety" if they truly want to encourage more people to abandon the car for their daily trips. Coincidentally or not, the new Directory of Urban Design for the City of Toronto, Harold Madi, was a major planner in each of the failed "shared space" projects (including the still under-construction Front Street) and is a big supporter of shared space. Madi is now well placed to influence the new Complete Streets guidelines. Madi, I've got a message for you: a "shared" street is not "complete" street if it ignores the safety and vulnerability of our young, elderly and disabled who ride bicycles on our choked, busy streets. If you need to know how to plan for true complete streets, just imagine your own mother (or grandmother or child) cycling on these routes. Then build them so your mother will happily choose cycle on these streets. If you have to "convince" her that it's actually safer than she feels, you've failed. (Plus you end up being just a Vehicular Cyclist dogmatist of a different flavour). in the UK we seem to developed a curious alternative strategy that, as in the title of this post, I’m going to dub ‘placefaking’. It involves dressing up streets that have continue to have a serious movement function as a ‘place’, and attempting to persuade us that these roads and streets are now ‘places’, despite the fact that they continue to carry significant volumes of motor traffic. The fiasco on John Street knows no end. On a couple of occasions I have cycled northbound on John Street at night after working late. I observe that rather than install much needed bike lanes, the City has opted for subsidizing a street long smoking pad for bars and their patrons. The Toronto's John Street smoking pad has forced the narrowing of traffic lanes, so I now ride center lane (aka lane blocking) for safety. Fortunately, the drivers I share this route with have demonstrated patience, but as your article points out, I am one of the confident users. I have seen other users on bicycles squeezed in between a car and the curb. Each time I see that I cringe for their safety; and then I am embarrassed by my City's choice to install a smoking pad rather than a bike lane. Of course, I also feel anger looking over to see the fakeplace John Street smoking pad empty in the morning waiting for its raison d'etre to provide a comfortable place for bar patrons to have a cigarette. The destination rhetoric is absurd. The logical conclusion that destinations should not serve to move traffic would suggest we remove all traffic lanes from Yorkville and Front Street. Instead of a shared space I wish Toronto could build cyclist-specific roads or mark parts of roads to serve cyclists specifically. If cyclists have to walk bicycles along themselves, they are not cyclists anymore, they are simple pedestrians! Narrow, purpose specific roads for cycling would, in the end, help the cars and pedestrians likewise to avoid cyclists. I recommend to look at some European countries, the Netherlands, Germany or Sweden to find solutions.